Is MT5 better than MT4? Read in our MetaTrader 5 Review! There is a variety of Forex brokers at the market, but deciding on a trading platform is not an easy task. It’s all about choosing the platform that best meets your needs. Brokerages may take the lead as they start offering a range of different new platforms to their clients, but users will have the final say. Big names like MetaQuotes are reinventing its products over and over again. They designed the MetaTrader 5 platform to upgrade its existing MetaTrader 4. Will brokerages rapidly upgrade to the new version? We honestly don’t know yet. But, how it compares with others you can read in our MetaTrader 5 Review. Ensure optimal performance by making the right decision! MetaTrader 4 has already a very user-friendly interface, but MetaQuotes was committed to upgrade and expand some of the existing features, so in the MetaTrader 5 platform you can see that the icons above the charting area are larger. One of the goals is to make it easier for users to find their icons, so the new interface attempts to be friendlier to navigate. Fortunately, there is no possibility to get lost using the MT5 platform if you are familiar with the MetaTrader software. MetaTrader 5 Review highlights that this trading platform is capable of processing different financial instruments with a wide range of trading activity. Traders may use a variety of indicators that can be attached to their charts. You can choose among four categories of technical indicators: Trend Indicators, Oscillators, Volume Oscillators and Bill Williams Indicators. Since MT4 and MT5 support the same indicators, you can use the traditional moving averages, but also try out the new ones. They are Adaptive MA, the Fractal Adaptive MA, the Double and Triple Exponential Moving Averages and the Variable Index Dynamic Average. The new version of MetaTrader Trading Software allows you to download a variety of external indicators available online and supported by other platforms. More to that there are addable objects to the chart, such as Fibonacci and Gann Angle Studies tools. When you have the opportunity to customise indicators, the chances of adopting new ways and trading methods are much bigger. MetaTrader 5 Platform includes a depth of market tool, which enables users with a market ladder for their day trading. Being clear that cTrader leads the depth of market tool field, it certainly is good to shorten distances with STP and ECN. Even when the tool is pretty basic, it was a necessary improvement, as the previous versions didn’t have any. In addition to the standard timeframes, the platform supports a wider range of possibilities, so you can still boost your flexibility and just enjoy the new ones. 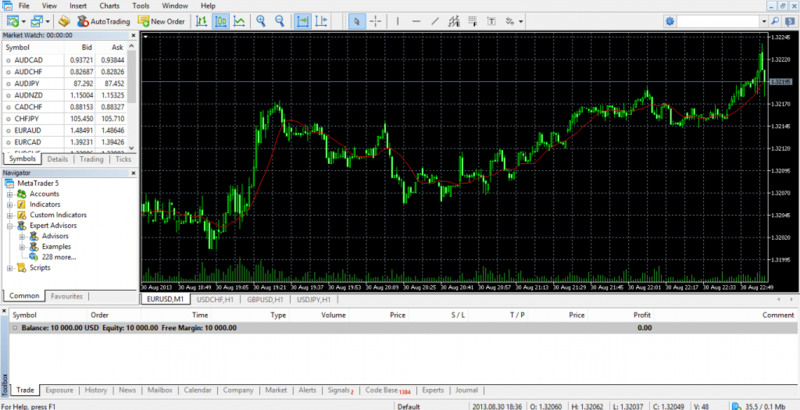 The MetaTrader 5 interface is easier to navigate than others, but they decided to reduce the size of the charting area. While MT5 Platform displays larger icons, the charts are quite smaller. For some people, this could be a reason to complain. However, this adjustment is hardly noticeable. Expert Advisors have already proven to be an excellent way to find market opportunities and automatically execute trades. MetaTrader 5 keep working with EA’s, but they tried to improve its own programming language, making the MQL5 more flexible yet complex. As the Expert Advisors for MT5 and MT4 are not compatible, MQL5 does not allow you to work with your previous version. For this good reason, some people remain reluctant to switch to the MT5 platform. Whether users would finally upgrade to the new version or not is still under evaluation. Overall, we can say that MT5 is user-friendly for either new or previous experienced customers. Forex Trading Bonus recons MetaTrader 4 is still better choice that its younger brother.